Apr 17, 2015: Bought 19 shares of CMI at $134.62 per share. Founded in 1919 and headquartered in Columbus, Indiana, CMI (NYSE:CMI) is one of the leading designers and manufacturers of diesel engines. The company also produces natural gas engines and engine components and subsystems. CMI sells its products to original equipment manufacturers, distributors, and other customers worldwide. 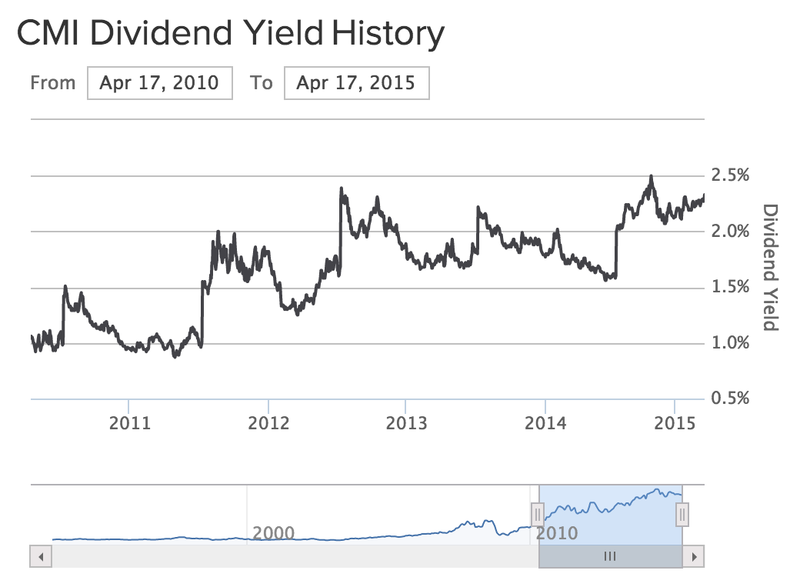 CMI is ranked 4th in the April 2015 edition of my 10 Dividend Growth Stocks article series. It also is the Industrials sector winner. The company has a 9-year streak of consecutive dividend increases. It pays quarterly dividends of 78¢ per share in the months of March, June, September and December. In the following 10-year price chart, my buy price is indicated. Notice CMI's extraordinary performance relative to the S&P 500 over this period. The stock has outperformed the S&P 500 by a margin of 6-to-1. Of course, CMI's performance over the last year has been less than stellar. 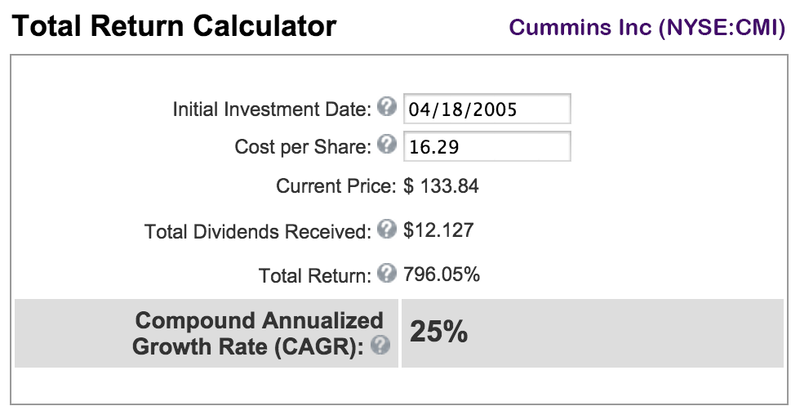 An investment in CMI 10 years ago would have returned a spectacular 796%, including dividends. That equates to a compound annualized growth rate of 25%! Not shown in the total return calculator below is the impact of dividend increases on YoC, which, after 10 years of dividend increases, would now be about 26%! It is highly unlikely that CMI would deliver similar results over the next 10 years. Nevertheless, I think the stock could deliver above-average dividend growth for many more years to come, even if earnings growth should slow down. My fair value estimate of CMI is $146.16, so I bought shares at a discount of about 9%. The following table provides some key statistics, with highlighted values relating directly to my selection criteria. (In the past week, since ranking a selection of stocks for my Seeking Alpha article 10 Dividend Growth Stocks for April 2015, CMI's star rating improved from 5 to 6 stars). 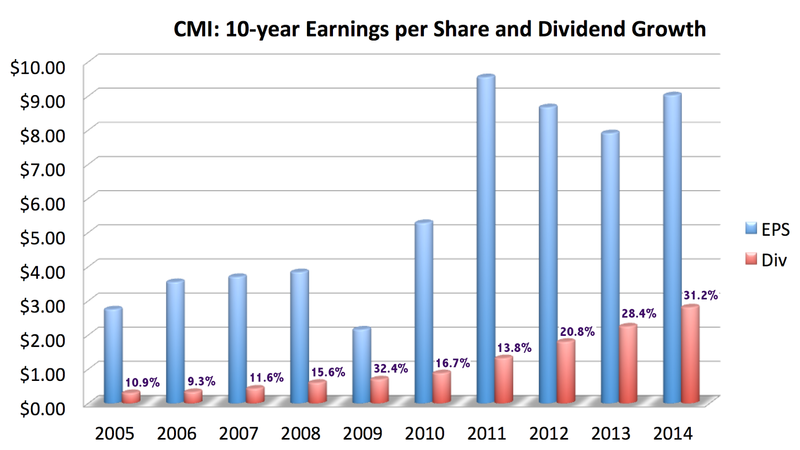 In fact, over the last 10 years, CMI's dividend payout ratio has not exceeded 33%, a level that is well below the 40% stated in my selection criteria. CMI has treaded water for a while now, providing an opportunity to buy shares at a discount to fair value. It should be noted, though, that a quality company like CMI does not get discounted without reasons. The company operates in a cyclical environment. The North American truck cycle may be peaking, while emerging markets continue to struggle. Falling commodity prices and the strong dollar are compounding factors. CMI is experiencing a challenging situation in Brazil, where 2015 truck production is expected to decline 15% as the government curbed its financing program. CMI is looking to China for growth, but a slowdown in manufacturing and construction looks probable, which would impact truck and engine sales and, consequently, CMI's growth prospects. Several analysis recently downgraded CMI, including Stifel and Goldman, citing reasons such declining Class 8 equipment orders and lower than anticipated market share in the Class 8 market, as well as the increasingly challenging multi-year outlook for machinery demand in Asia, the Middle East, and South America. Nevertheless, I like CMI for several reasons. 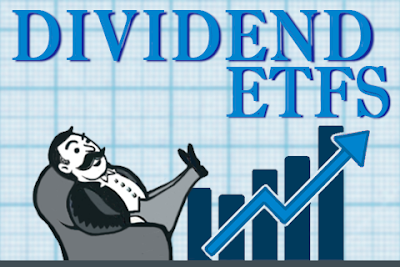 As a dividend growth investor, the company's dividend growth rate is very attractive and, given the relative low payout ratio, I expect strong dividend growth to continue in the foreseeable future. Aside from dividend payout increases, the company is also pursuing aggressive share repurchases. In 2014, for example, CMI repurchased 4.8 million shares for $670 million at an average price of $139.58 per share. For 2015, CMI expects revenues to increase 2-4%, with EBIT (earnings before taxes and interest) of up to 14% (which would top 2014's EBIT of 13.2%). 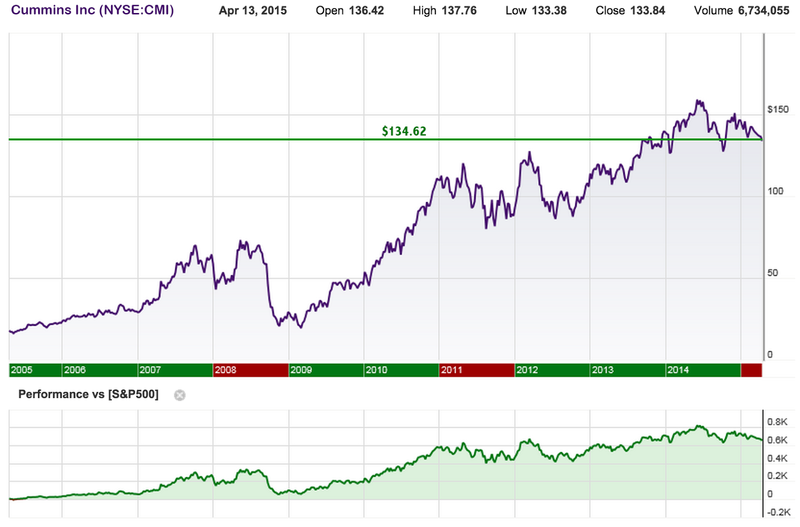 Finally, CMI is trading at a discount of about 9% to my fair value estimate of $146.16. A recent ModernGraham valuation of CMI rates the company as undervalued, while Baird upgraded CMI to Outperform with a price target of $166. 19 shares of CMI adds $59.28 to DivGro's projected annual dividend income. I've updated my portfolio to reflect this purchase. What do you think of CMI? A great company to own, DivGro. I looked at CMI recently and was happy with most of the their metrics. The company has some strong fundamentals and a bright future ahead. Congrats on adding this company to your portfolio and increasing your fy dividends. I absolutely agree! To me it looked like a great buy, even if the company is experiencing some headwinds right now. As a dividend growth investor, I look for long term investments, so I'm willing to wait for CMI to address the issues it has. Thanks for commenting, and take care! wow never heard of this one. i really like what i see so far. thanks for the great post. Sure, FFdividend -- glad to introduce you to CMI. I think it is a great company trading at a discount right now. It has some headwinds, but I think it will overcome those and deliver some amazing dividends in the years to come. Excellent buy Ferdi. I've been watching this stock for a while now. I'm not sure why I have not added it to my portfolio. I think you will be happy with future dividend increases. Cool! I'm glad other dividend growth investors also see the value in CMI. Hopefully, we're right and the stock goes from strength to strength. Best of luck in deciding whether you'll be a buyer. Nice move, FerdiS. I have this stock on my watch list, but haven't looked into details yet. Will do some homework. Thanks -- take a look and let me know what you think. Obviously, I liked what I saw and jumped on the bandwagon! Take care! Good buy FerdiS! Like much of the numbers too. Thank you for sharing this idea! You're welcome, Mike. Before spotting it in my April 2015 list of 10 Dividend Growth Stocks, I wasn't really even aware of Cummins. Anyway, I liked what I saw when I started delving in a little deeper. Great to have you aboard! I own CMI at a higher cost basis. Prob not the best short term investment. But should be a great one long term. Glad to be a CMI shareholder! You should be fine with your higher cost basis in the long run! Solid analysis. Thanks for sharing and congrats on another purchase! Thanks, Professor -- just keeping the investments going so I can hit my 2015 goals by year's end. Great buy Ferdis. Never heard of the company before but after reading it I am hooked. Great valuation with amazing CAGR. I will keep my eyes on it. Yeah, the CAGR is what made me take extra notice of CMI, especially how it is accelerating. Fascinating stuff. Take care!